I'm running a little later than I hoped, but then you've got to grab the sun when you see it, and now it is raining, so I am glad we did. This week I've ticked two quick makes off the list, both were gift ideas and I would probably give both a whirl again. These are Non-felted Slippers made in two shades of Sirdar Click which I found in a bargain bin at my LYS....after I started making them, I realised it would have been more sensible probably to put the darker colour on the sole.....but hey, that's living dangerously! 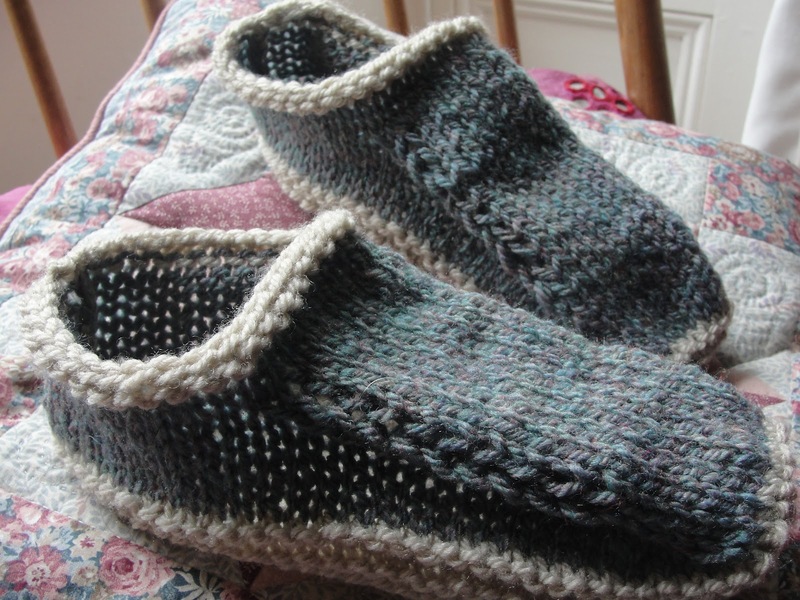 This type of pattern is what makes me interested in knitting......you start and the slipper appears from no-where.....very clever pattern....I will definitely make these again...in fact, I may make every member of my family, a pair for Christmas! The next finish was also a quick fix, although maybe not as quick as the slippers. This is a pinwheel purse which hasn't actually finished blocking, but for the purpose of the post, I will pretend it has. A neat little pattern where you sew together five little squares, four of them with a purl row in the middle which allows the fabric to fold and therefore close the purse. I made this on slightly larger needles than called for, but next time, having now bought the correct size, I will do it as the pattern says, as I think it will be neater....great idea for putting a small gift in, like some jewelry, also great for using up left over sock yarn. So that's me for this week, I have been a bit of a butterfly, flitting from one thing to another (but that's another post), it makes life more exciting.......I now have my head deep in the realms of pencil cases as the mad dash starts to make all the teacher pressies before the end of the week. Thankyou for all your lovely comments on my last post, what a truly wonderful bunch you all are! Looking forward to boys tucked up, cup of tea and time to look through all the other YOP work. To check out other bloggers' progress, see the Ravelry page here. Oooh those slippers look cosy! I wish I could knit, I'd have loads of these as I'm typically a cold person. Love the photo of your boys in the trees in your last post. They are soooo cute! Lovely slippers...particularly the knitted ones! great slipper...................they look so comfy and warm. I just love those slippers and at the first picture I was thinking, gosh, they'd make a great gift for family for xmas, so into the favourites pile they go and I feel some little ones might want some. Love the purse, it looks so dinky. Hope you get all your teachers presents done on time this week. Those slippers are so sweet, I am sure my family would love them too. I love that pinwheel box, I have it in my queue, I just haven't gotten around to it, maybe I should use up some of my little balls of stash I have to make a few, looks fabulous to store stitch markers in as well. Cute slippers! The grey seems like an entirely suitable sole colour to me. Seems like most of my dust bunnies are about that shade, LOL! Lovely slippers, Faith - I really like them - and I bet they'll get a lot of use this 'summer'! 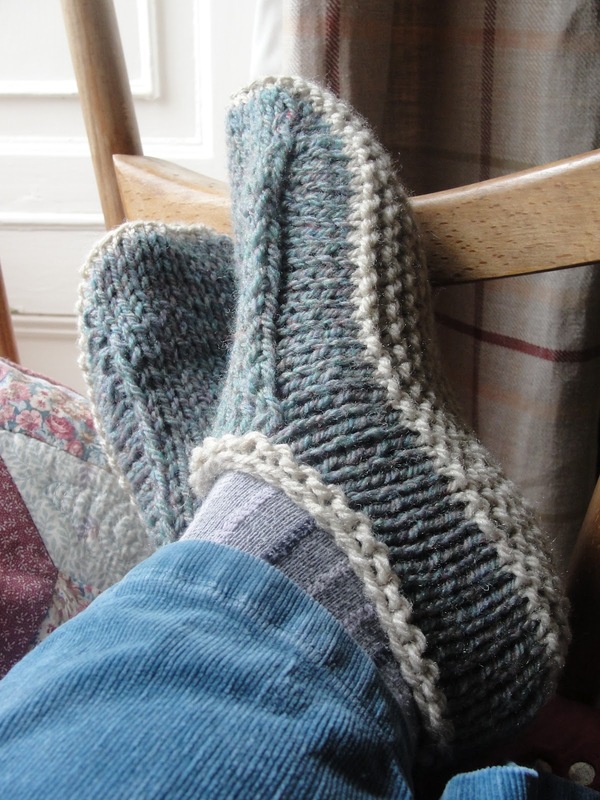 Both of your finishes are great :) I love the slippers and have slipped them into my library and may look at them later in the year depending on how I go with Christmas presents I already have on my list! Oh great...another project to add to my "want to knit" list....I love those slippers...and making them for Christmas gifts would be a great idea....uummmmm wonder if I can fit them in???? I've been looking for a great pair of slippers to knit for a friend's upcoming birthday and these look perfect! 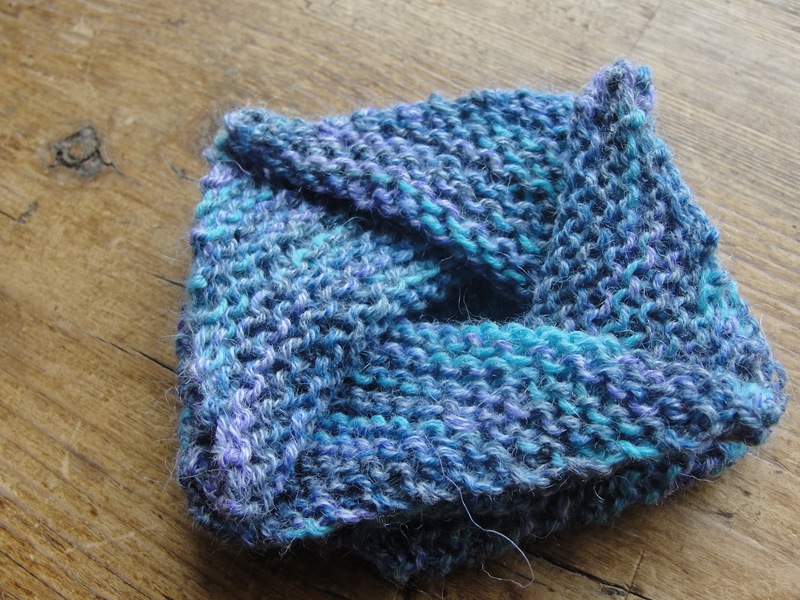 Amazingly, I just came across the pinwheel purse the other day and thought to myself "I have to knit this!" Those slippers looks super comfy!! What a cute little purse! Love those slippers and that purse is adorable!!!!!! What great projects - thanks for sharing them! I am certainly thinking of making some of those slippers - they look great! I love your slippers! They look so comfortable and cosy! I´m sure they make a great gift! Love the idea of the little purse for jewelry. I'm not really into stashing sock yarn, how do you think it would work with DK? I love the slippers. I think you were right to live dangerously, because they look awesome with the light color on the sole and for the details! I love the slippers, I think the colour placement is just right. And the pinwheel purse is so cute! Those slippahs have great shape! I like the hint of white around and on the bottom! Each ohana member is going to be super lucky to get a pair from ya. Lovely, Faith. I really like those slippers. Oh but the slippers turned out wonderfully! I am adding that pattern to my favorites. I am wondering how hard it was? Was there much seaming? Those are the nicest looking slippers I've seen and I've seen a lot! LOL! Mostly crocheted ones but those are really good looking! I may have to try them. It's Christmas in July when I start making my list for presents to make and I can't believe I forgot that on my YOP list or that I missed this post of yours! I think the heat here is starting to affect my brain. I hope you know how much I REALLY loved your presents! I'm still in shock over it all. I started reading the brioche knitting last night and it seems like it's not just a new stitch but a whole different way of knitting...terminology and all. It gives gorgeous results though. Have you done any? It's a little advanced for me but maybe someday? Do you think I could ever be that good? Practice makes perfect but I have a long way to go. I am certainly enjoying it though! See you later on YOP for this week!